This didn’t mean the two navies would remain in the same location for the duration of the exercise, Lt. Cmdr. Tim Hawkins, a spokesman for the Vinson strike group, told The Japan Times, adding that he wouldn’t discuss specifics regarding future ship movements for security reasons. The navy said that as part of the exercise, four MSDF liaison officers had embarked on the Vinson to support combined operations. The operations will include formation steaming as well as anti-submarine and air-defense training, and the Ise will also conduct a replenishment-at-sea with the Vinson. The MSDF and the Vinson conducted joint drills last April in the western Pacific and in the East China Sea in March. China claims virtually the entire South China Sea but the Philippines, Vietnam, Malaysia, Taiwan and Brunei also have overlapping claims in the waters. Beijing has stoked concern in the region after building up a series of man-made outposts in the Spratly Island chain, including what experts say are now fully functioning air and naval bases. The U.S. has also criticized the Chinese militarization of its South China Sea islands, fearing the outposts could be used to restrict free movement in the waterway — which includes vital sea lanes through which about $3 trillion in global trade passes each year — and has conducted numerous freedom of navigation patrols in the area in recent years. Beijing has disputed this claim, saying the militarization of the outposts has been for self-defense purposes. Experts say China hopes to secure control of the strategic waterway, which it envisions as a bastion for its nuclear-armed submarines. The Ise, a nearly 200-meter (646-foot) helicopter destroyer, displaces 18,000 tons and sails with three helicopters. The ship’s primary missions include anti-submarine warfare, mine countermeasures, logistics, and search and rescue. 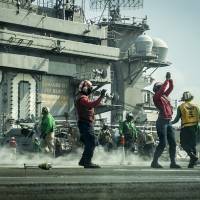 The Vinson strike group, meanwhile, also includes Carrier Air Wing 2 and a complement of more than 70 aircraft, Destroyer Squadron 1, and the guided-missile destroyer USS Michael Murphy. The Murphy conducted a passing exercise with the French frigate FNS Vendemiaire while operating in the Western Pacific and South China Sea in January and February, the U.S. Navy said. Sailors practiced communication and ship-handling techniques. 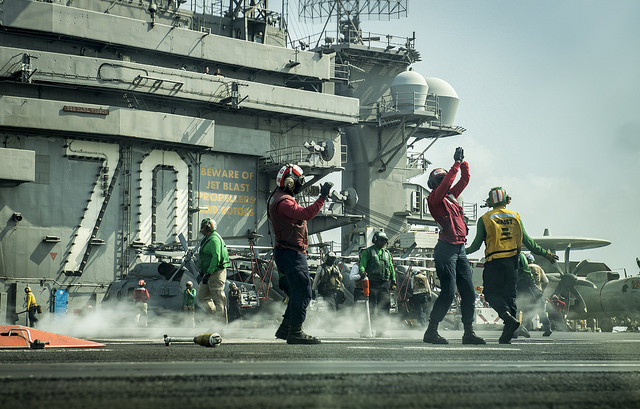 The Vinson strike group completed a historic port visit to Vietnam on March 9, which marked the first time a U.S. aircraft carrier had visited in more than 40 years.